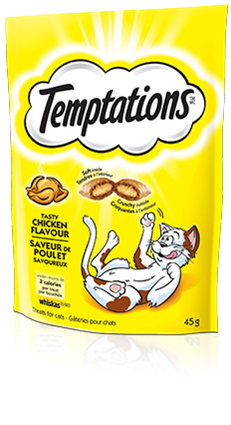 TEMPTATIONS® Tasty Chicken is rated4.7 out of5 by25513. Rated 5 out of5 byLUCIEB_QC_12682 fromI hope you will understand my answer ! ;) Everyday ... when I move a little bag of temptations ... my cats run everywhere to find me in the house ! I am rescue ... my 2 cats and the others kittens in house are so excited ! It's amazing ... it's a better moments in the day ... kittens run after my bigger cats to see me ! I love this moments ... it's funny seeing my colony arrive from everywhere ! They really like Temptations ! When my home become a big a funny run until this pleasure ... I feel happy too ... I love my cats and my kittens , my cats and the olders cats ... love this gift ... Temptations is a gift moments !!! Thank you ! Rated 5 out of5 byTAMARAE_ON_22763 fromSpartacus (my Savannah kitten) is very finicky with canned food, treats and human food with the exception of shrimp. He mostly eats raw whole prey and shrimp. I've tried other treats and he has gagged on the smell of them refuse to eat them. I assumed Spartacus would do the same with Temptations. However, he lived them so much, he stole the bag when I was looking and tore it open to eat all. I have since bought him large bags of All Natural Temptations. I have posted a video of Spartacus getting treats out of the bag with his paw his head on his Instagram acct (SpartacusTheSavannahCat) Your welcome to view it. Thank you for the sample. Rated 5 out of5 byMERYAA_ON_15856 fromThese are an invaluable training aid! My cats love Temptations so much! As soon as the hear the bag rustle they flock over to me! I repeat Who wants a treat or simply treat , I also use a clicker as I'm tossing the Temptations on the floor. They became conditioned to the point that they'll come when called or to the clicker sound. Their response is excited enthusiastic! So yeah, I can truthfully claim I've got trained cats! ( thanks to Temptations! ) Also since I'm active in rescue, I've discovered that Temptations will stimulate the appetite of an ill or anorexic cat. The strongly appealing scent flavour also helps me bond with feral cats! Rated 5 out of5 byFRANCESW_ON_61262 fromBinky is a creature of habit. My roommate is up at 4 am and Binky is waiting for his 'cookies' as soon as her alarm goes off. When she gets home from work, he sits on her bed till he gets more cookies. Then at night when I start getting ready for bed, as soon as I turn off the TV and lights he is on my bed, waiting for the all important bedtime snack. He will be 12 this fall and his treats have always been Temptations. So Binky thanks you for his great tasting cookies. p.s. have you ever thought of making a vegetarian one ... I have a mini poodle who loves them also but is allergic to all meats. Just a thought there might be cats with allergies also. Rated 5 out of5 byMAUREENP_ON_19037 fromBoth of our cats loved the treats. We kept them on top of the fridge - the cats kept bringing us to the fridge with cute meows. We had purchased some just shortly before the sample arrived. When I purchase next time, I think I'll try the hairball one. Our larger cat has digestion problems, so while our tabby gets 2 or 3 treats, the black cat only gets one. She has had digestion issues with other brand too. I think she may need the hairball treatment one. The cats and our family had a lot of fun with the sample you gave us - the cats because they enjoyed them; and us, because the cats were super cute trying to find ways to obtain them. Thank you very much. Rated 5 out of5 byNOLAA_BC_46735 fromi picked up the mail and my sample was there. I poured myself a coffee and called my cat over to my chair . I was shaking the package to get her attention, When I offered her her first treat she was all over my hand smelling it with such excitement. After she ate the first one she was all over me begging for another. She has never been that affectionate, She followed me everywhere meowing and jumping up for another treat. I had to make a special trip to the store to buy her some more. Now when I call her inside from the garden area she comes running for her treat. Thank you so much for introducing me to temptation treats through your sample packs. Rated 5 out of5 byIRENED_AB_8981 fromi love the product because our cat Jerry is always hungrey and it keeps him quiet till i get his food out for him to eat. charlie our black cat is a little more fussy so i give him temptation till he gets his food, also Keeta she jumps on the counter to eat right now so it keeps her busy till i get her meal on her plate..she black and white,Jerry is all grey.we have a little pom /Chihuahua cross,and he just loves the little morsels,.he's like a little vulture,he watches the cats and waits,till they are gone and he run in and nabs the little kibbles of temptation. thank you.we buy all 3 flavors,fish beef and chicken.